The service display is shown on the instrument cluster and in the infotainment system . 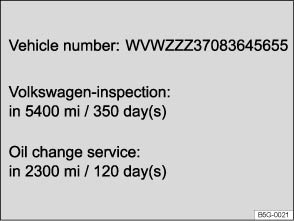 Volkswagen services are divided into two categories, with oil change, e.g. oil change service, and without oil change, e.g. inspection. In vehicles with fixed service, services take place at predefined intervals. The service intervals are calculated on an individual basis in vehicles with flexible service. Advances in technology have brought about a considerable reduction in servicing requirements. An oil change service must only be carried out when required by the vehicle. The individual conditions in which the vehicle is used, as the driver's personal driving style, are taken into account. The service reminder is displayed 30 days before the service is due. The distance is rounded to the nearest 100 km; the remaining time is rounded to full days. If an oil change service or inspection is due soon, a service warning will appear the next time the ignition is switched on A. The number of kilometres or amount of time shown correspond to the maximum number of kilometres or maximum time that can still be driven before the next service. If a service is due, an acoustic signal will sound and the spanner symbol with the message Service now! will appear for a few seconds in the instrument cluster display when the ignition is switched on. B. Press and hold button until the word Service appears in the display. Release the button. The current service message will be shown in the display. Service information can also be displayed in the infotainment system by pressing the button and the and Service function buttons . Switch off the ignition and press and hold button . Release button ④ and then press it again to reset the service interval display. The service message will disappear after a few seconds, when the engine is running, or when the button on the windscreen wiper lever or the button on the multifunction steering wheel is pressed. If the vehicle battery was disconnected for long periods in vehicles with flexible service, the system cannot calculate the time at which the next service is due. The information shown in the service interval display may therefore be incorrect. If this is the case, please heed the maximum permissible service intervals listed in the ⇒ BookletService Schedule, .